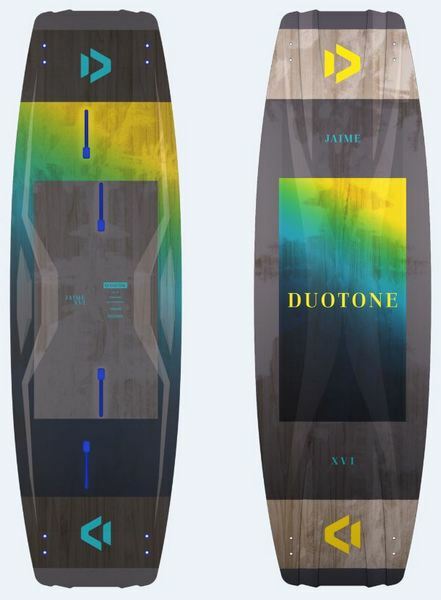 The Jaime is a board that needs no introduction, it has plenty of fans all over the world and has inspired the style and progression of thousands, yet it is again completely redesigned to again set the benchmark. It is the go-to board at your local spot and all your travels all over the world. The Double Diffusor Bottom provides plenty of grip for blasting upwind, and the board is fast and dynamic through the water. Perfect for hooked and unhooked tricks, the board rides exceptionally well with straps thanks to its unique shape and flex. Wide tips offer a massive amount of pop, and the medium flex ensures comfort in all conditions. If you want to boost massive airs, throw down some freestyle and land mega loops at Mach10, this is the board for you! The most popular twin tip on the planet, the Jaime, defines an era and a style that many riders aspire to. This year it´s completely redesigned, offering the new and fantastic Double Diffusor Bottom and again made a huge step forward. MEDIUM FLEX - combines competition performance with every day comfort. Precise adjusted materials offer control, power and comfort in just the right way to feel good in every condition. The Premium Construction boards Jaime, Select and Soleil feature Carbon Beams, where parts of the glass fibre are being replaced by unidirectional carbon beams to noticeably improve the boards’ performance. This results in a faster and even more progressive flex for better pop and reduced weight. For easier board off maneuvers and comfortable general riding.